After finishing up the Katie Jump Rope pillow on Saturday morning, I picked up a couple of my craft books to look for ideas for the rest of my day. 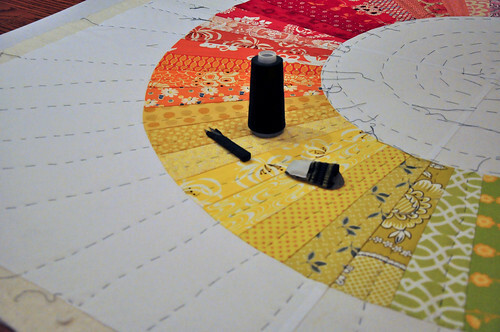 The Color Wheel Quilt in Last Minute Patchwork + Quilted Gifts caught my eye. 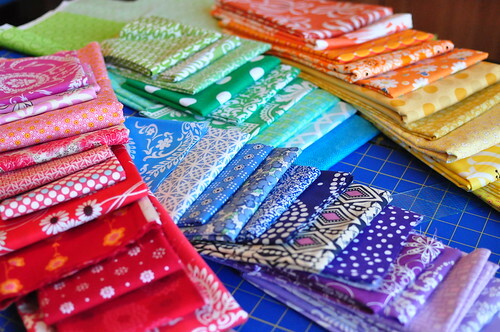 By noon, I had 52 fabrics pulled from my stash. 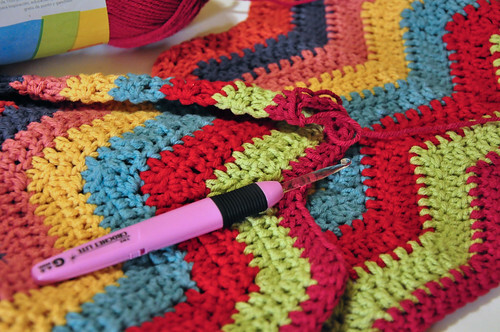 On the way to and from lunch, I worked on my crochet ripple. I wasn't driving. And by evening, I had my quilt top. And that's when I went crazy. I decided I want to hand quilt it. I've never hand quilted a quilt before, but this one seems like a good place to start. Straight lines radiating from the center and then a row of stitching on the inside and outside of the wheel. I took a hand quilting class last week at my LQS. A very sweet woman who has been hand quilting longer than I've been alive gave me more information that I could have ever obtained in a book. My stitches were a little long, but she said they would get smaller with practice and to concentrate on keeping them consistent rather than being concerned about the stitch length. 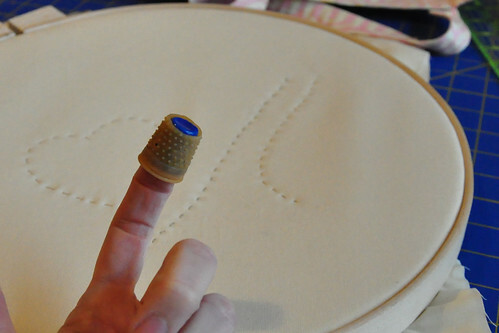 She even customized my quilting thimble for me. So, I've been thread basting today. My fingertips are so sore! Just fabulous!! I am looking forward to seeing the whole quilt! Wow! Good for you for having such a diverse stash to make your own color wheel! 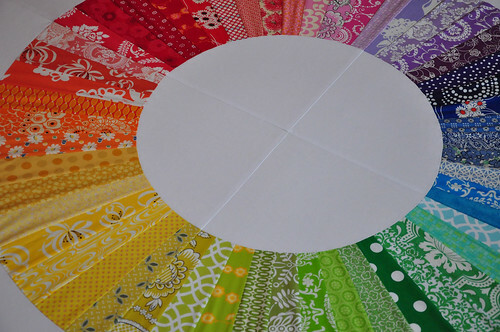 I was just in NYC and went to Purl and splurged on a pre-made color wheel kit. Now the only problem is their bundle looks so cute on display in my sewing room that I don't want to cut into it! It feels like Christmas morning.